Small cross-drilled holes can pose significant deburring challenges for parts manufacturers. Cross-drilling creates burrs, protrusions of cut, torn, folded, and jagged metal that can affect dimensional tolerances, cause part misalignments, and limit the overall efficiency of machined components. Different cross-hole deburring technologies are available, but manual burr removal can be labor-intensive. For industries such as medical device manufacturing, part quality and consistency are also essential. As a full-line supplier of surface finishing and deburring solutions, Brush Research Manufacturing (BRM) understands the needs of parts manufacturers – and the increasing demand to deburr smaller cross-drilled holes. That’s why our family of Series 81A stainless steel wire mini brushes continues to grow. Recently, we added three new smaller brush sizes: .014”, .018”, and .020”. These all stainless steel tools feature .003” filaments and are designed specifically for thru-hole applications. BRM’s miniature stainless steel wire brushes may be small, but they can have a big effect on your parts finishing operations. For example, by removing small surface imperfections from hard-to-reach areas, Series 81A brushes can improve part quality and consistency. In addition to micro burr removal, these brushing tools can be used for surface preparation, internal cleaning, and rust removal. Series 81A miniature stainless steel brushes are also used to remove chips from cross-drilled holes, and to clear break-through burrs. Mini brushes that use other filament materials (such as abrasive-filled nylon) have their advantages, but all stainless steel tools are more than just tough and long-lasting. For example, unlike other types of metal, stainless steel won’t corrode and leave after-rust deposits on finished parts. BRM’s miniature stainless steel brushes are also easy-to-use. Because they’re non-loading, they won’t clog with debris. To run a tool under power, just chuck the metal stem in a handheld electric drill. Don’t reverse the brush inside the hole, however. For manual deburring, use Series 81-A deburring tools with BRM’s double-end pin vise. Built with double collets on both ends, it’s a safe and reliable tool-holder. Are miniature stainless steel brushes right for your cross-hole deburring application? These brushing tools are dependable and easy-to-use, yet some manufacturers still haven’t tried them. Of course, if your only option is to buy a large set of tools, the cost may keep you from investing in the deburring solutions you really need. 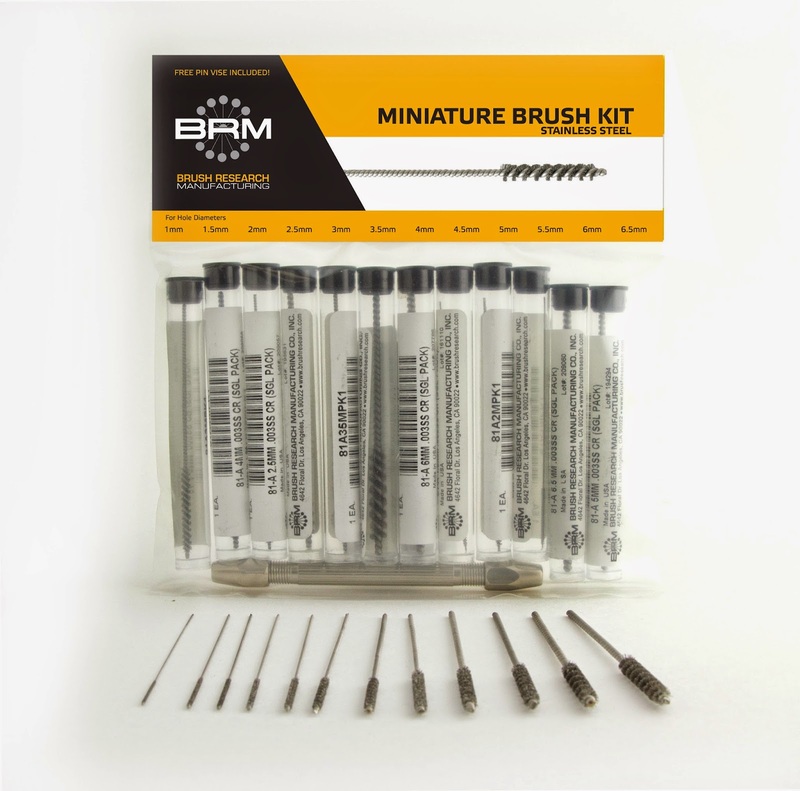 That’s why BRM now offers a new 12-piece mini-brush kit. To learn more, get the brochure.